Let’s start the new year in a healthy way, the same way we have done in previous years. We might not keep it up after January, but it’s easier to stick to eating healthy if the food is not only healthy, but also delicious. And that’s exactly what these granola bars are, they taste amazing and have less sugar and fat than the ones you get at the grocery store. What I do is make them at the beginning of each month so that I can have something on hand every week whenever I have a craving for something sweet, which for me it’s usually between 2-4 in the afternoon whenever I’m at work. They’re also great to bring along whenever we go out on car trips. If somebody has a hunger attack, I have them ready for them to munch on. The ingredients don’t have to be the same I use in this recipe. If you don’t like coconut, don’t add it. If you want to use other kinds of dry fruit, you can also do that. Make these bars with the ingredients you like best and you’ll see that you’ll enjoy eating them even more. Pre-heat oven to 350ºF (180ºC). 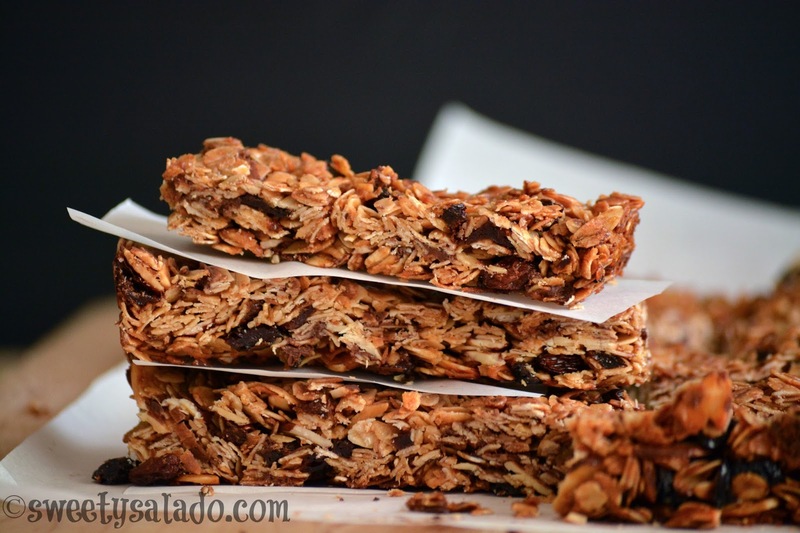 Place oats, almonds and coconut on a baking sheet, mix and spread well with your hands. Roast for 8-10 minutes or until they're slightly roasted. Remove from the oven and let cool for about 10 minutes. Reduce oven temperature to 325ºF (163ºC). n a small saucepan melt the butter on medium heat, then add the honey, brown sugar and salt and stir until the sugar dissolves. Turn off the heat, add the vanilla extract and then set aside. Place the roasted oats in a large bowl and add the raisins and cherries, mix well. Now pour the butter and honey mixture over the dry ingredients and mix again. You can also add the chocolate chips if you want the bars to have a little bit of chocolate flavor. Transfer the granola mixture onto an 8 x 8 inch (20 x 20 cm) baking pan covered with parchment paper. Spread it well and press firmly with your hands. Bake for 20-30 minutes. Then take it out of the oven and let it cool completely inside the baking pan. 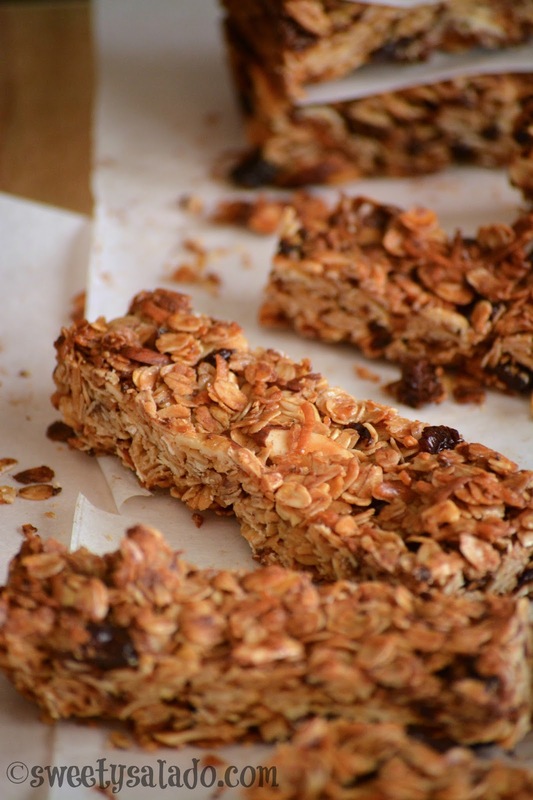 Take the granola mixture out of the baking pan and divide it into bars the size that you want.